In this study, SNP maps and gene haplotype based on 400 alleles from healthy blood donors are generated for the most relevant coagulation factors. By including gene haplotypes in the characterisation of genes it is anticipated that the genetic variability observed on the SNP level can be reduced and then becomes reasonable for routine diagnostic procedures. This approach significantly facilitates the implementation of clinical association studies in large patient cohorts (e.g. myocardial infarction). Complementary information about the significance of SNPs/gene haplotypes will come from expression studies of recombinant protein variants which will allow the functional characterisation of SNPs at a molecular level. A special focus of this study is the characterization of the vitamin K epoxid reductase (VKORC1). This gene has been recently identified by our group by positional cloning. It represents the molecular target for coumarin derivatives, and will be the object in molecular as well as pharmacological/clinical studies. VKORC1 recycles vitamin K 2,3 epoxide to vitamin K hydroquinone which functions as the essential cofactor for gamma-carboxylation of Gla-domain proteins such as coagulation factors II, VII, IX, X, protein C, S, Z, osteocalcin, matrix Gla protein (MGP) and Gas6. Mutations in VKORC1 cause two distinctive phenotypes: a homozygous missense mutation in the VKORC1 gene leads to combined deficiency of vitamin K dependent coagulation factors type 2 (VKCFD2) and heterozygous missense mutations are responsible for hereditary warfarin resistance in humans, rats and mice. Coumarin derivates such as warfarin are the most commonly prescribed oral anticoagulants. By inhibiting VKORC1 activity these drugs reduce vitamin K recycling efficacy which limits carboxylation of vitamin K dependent proteins. A severe drawback of coumarin anticoagulant therapy is their high inter-individual variation in dose requirement due to multiple pharmacokinetic and pharmacodynamic factors leading either to severe bleeding or thromboembolic complications.. Acquired factors such as interactions with other drugs, intercurrent illness, and variable dietary intake of vitamin K account for part of this variation, but several studies have shown that genetic factors contribute as well. Recently, two common genetic variants of the VKORC1 gene have been linked to individual warfarin dosage requirement. In order to clarify whether these SNPs are part of more extended haplotypes, we established a comprehensive haplotype map of the entire VKORC1 gene locus. Analysis of patient cohorts and public databases showed that these haplotypes were strongly associated with the inter-individual and inter-ethnical variability of oral anticoagulation. Fig. 1: The vitamin K cycle. 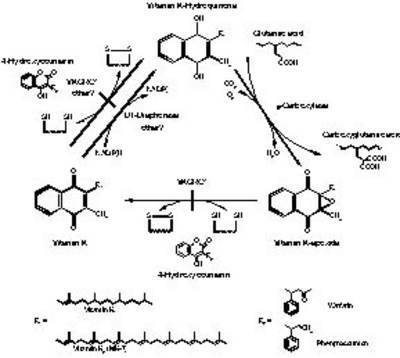 Vitamin-K-dependent γ-carboxylase uses reduced vitamin K hydroquinone (KH2) and oxygen as a cofactor to add a carbon dioxide molecule to the side chain of glutamic acids in various vitamin K dependant proteins, producing γ-carboxyglutamic acid and vitamin K 2,3-epoxide (KO). Coumarin derived anticoagulants such as warfarin or phenprocoumon block recycling of KO by inhibiting the two dithiol-dependant steps, performed by VKORC1. NADPH-dependent vitamin K-reductase, also known as DT-diaphorase may take over the last step, but via this bypass only vitamin K quinone, and not the epoxide can be converted into the required hydroquinone. By screening 25 genes from the coagulation system, we could identify until now about 280 polymorphisms leading to completed SNP maps for 10 of these genes. For these genes, haplotype analysis has been performed facilitating further genotype – phenotype association studies. In a sample of 200 volunteers representing 400 alleles, we identified 28 SNPs within the VKORC1 genomic sequence. Six of these SNPs formed three main haplotypes (VKORC1*<?xml:namespace prefix = st1 ns = "urn:schemas-microsoft-com:office:smarttags" />2: 42%, VKORC1*3: 38%, and VKORC1*4: 20%), which were in complete linkage disequilibrium. These haplotypes were further subdivided by additional polymorphisms. Haplotype VKORC1*2 includes a SNP in the promoter region (c.-1639G>A, dbSNP:rs17878363 that was identified as a marker for low dose warfarin requirement. In a cohort of 50 consecutive patients without mutations in the VKORC1 coding region who presented with phenotypes of either increased coumarin sensitivity or partial coumarin resistance we found a strong association of VKORC1 haplotypes and the observed phenotype. 93% of patients with increased coumarin sensitivity but none of patients with partial coumarin resistance were found to be homozygous for VKORC1*2. Vice versa, non VKORC1*2 haplotypes were found homozygous in 86% of patients with partial coumarin resistance but in none of patients with increased coumarin sensitivity. The VKORC1*2 haplotype also explains inter-ethnic differences in coumarin requirement. Haplotype analysis revealed a prevalence of 95% for VKORC1*2 in Chinese. This frequency corresponds well to the reported low dose warfarin requirement in Chinese and Malay similar to Europeans homozygous for VKORC1*2. An effect of VKORC1 genomic variation on warfarin dosage is also implied by the haplotype distribution found in the African populations. The suggested warfarin sensitive haplotype VKORC1*2 is less frequent in Africans compared to Europeans or Chinese. This is in perfect agreement with the observation of significantly higher average warfarin requirement in patients of African ethnicity. Interestingly, the haplotype VKORC1*1, which is the putative ancestral allele, is exclusively found in the African population. Furthermore, we could prove that mutations in VKORC1 cause resistance to anticoagulant-rodenticides in rats and mice. Several wild populations have been reported from many countries and pose a considerable problem for pest control. Resistance is transmitted as an autosomal dominant trait. We could identify eight different mutations in the VKORC1 gene, in resistant laboratory strains of brown rats and house mice and in wild-caught brown rats from various locations in Europe with five of these mutations affecting only two amino acids By recombinant expression of mutant VKORC1 constructs we demonstrated that these mutations confer resistance to warfarin at variable degrees and additionally reduce VKOR activity. Due to these results, DNA-based field monitoring of anticoagulant resistance in rodents now is possible. As mutations in VKORC1 result in two different phenotypes, (warfarin resistance and multiple coagulation factor deficiency type 2) we expressed recombinant VKORC1 mutants. By targeting residues highly conserved throughout many species, we were able to identify a CIVC motif critical for reductase activity and a TYA motif, probably involved in warfarin binding. These findings endorse the concept of different binding sites for vitamin K epoxide and coumarins. Fig. 2: Proposed membrane topology of VKORC1 (modified according to Tie et. al 2005 ). The model predicts three transmembrane α-helices. Functional motifs comprising TYA warfarin binding site (aa 138-140), CIVC redox motif (aa 132-135), ER retention signal (aa 159-163), and five amino acids conserved throughout all species (aa Cys43, Cys51, Ser/Thr57, Cys132, Cys135) are marked by coloured circles. Fibrinogen is an important component of the coagulation cascade, as well as a major determinant of blood viscosity and blood flow. Moreover, it plays a critical role in physiopathological processes, such as inflamation, atherogenesis and thrombogenesis. Fibrinogen is a soluble plasma glycoprotein, comprised of three pairs of non-identical polypeptide chains, linked to each other by disulfide bonds at their N-termini. The fibrinogen protein chains are encoded by three genes grouped in a cluster (FGA, FGB, FGG). By screening these three genes for polymorphisms, we identified a missense mutation in the fibrinogen γ gene (FGG) resulting in the substitution of Ala by Gly at amino acid position 82. In patients, γAla82Gly previously has been shown to cause hypofibrinogenaemia associated with a mild bleeding tendency. As this mutation was present in a normal control cohort, we screened 616 healthy individuals from the blood donor service unit of the University of Bonn (Western Germany) in order to allow a more exact estimation on the frequency. The resulting overall allele frequency was calculated as 0.0032 ± 0.0016. From these data, the frequency of homozygous carriers of the γAla82Gly allele in the population was estimated to 1 : 95.000, under the assumption of Hardy-Weinberg genotype proportions. Due to the frequency, we hypothesized that the γAla82Gly may represent a common founder effect. This assumption was verified by typing four blood donors as well as three patients carrying the γAla82Gly mutation. Moreover, this mutation is in complete linkage disequilibrium with the β(854) G>A polymorphism in the FGB gene associated with increased plasma fibrinogen levels. Completing more SNP maps of coagulation factors and screening of large patient cohorts will lead to the identification of further clinically relevant haplotypes. We expect that such haplotypes will contribute to the future direction of individualised diagnosis and also treatment algorithms. The VKORC1 haplotypes represent a perfect model how genetic variation in the normal population is affecting dose, efficacy and side effects of a certain drug. Solving the VKORC1 structure and function will led to an understanding of the underlying (patho)physiology of the vitamin K cycle. Common genetic variants modulating clotting activity likely have a substantial impact on vascular diseases such as myocardial infarction and stroke and thus play an important role in the pathogenesis of atherosclerosis. By applying our genetic findings to well diagnosed and classified patient cohorts we are aiming to identify such associations resulting in improved medical care of patients. 1. Fregin A et al. Homozygosity mapping of a second gene locus for hereditary combined deficiency of vitamin K-dependent clotting factors to the centromeric region of chromosome 16. Blood. 2002 Nov 1;100(9):3229-32. 2. Rost S et al. Mutations in VKORC1 cause warfarin resistance and multiple coagulation factor deficiency type 2.Nature. 2004 Feb 5; 427(6974): 537-41. 4. D'Andrea et al. A polymorphism in the VKORC1 gene is associated with an interindividual variability in the dose-anticoagulant effect of warfarin. Blood. 2005 Jan 15;105(2):645-9. 5. Rieder MJ et al. Effect of VKORC1 haplotypes on transcriptional regulation and warfarin dose. N Engl J Med. 2005 Jun 2;352(22):2285-93. 6. Geisen et al. VKORC1 haplotypes and their impact on the inter-individual and inter-ethnical variability of oral anticoagulation. Thromb Haemost 2005 in press. 7. Rost S et al. 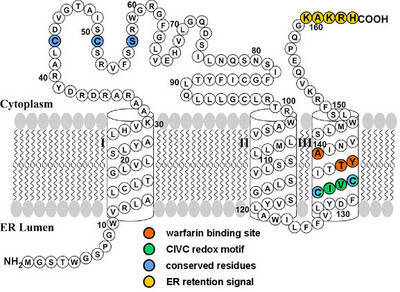 Site directed mutagenesis of VKORC1, the target protein of coumarin-type anticoagulants provides evidence for thioredoxin like redox centre and the warfarin binding site. Thromb Haemost, 2005 in press. 8. Tie JK et al. Membrane topology mapping of vitamin K epoxide reductase by in vitro translation/cotranslocation.J Biol Chem. 2005 Apr 22;280(16):16410-6.